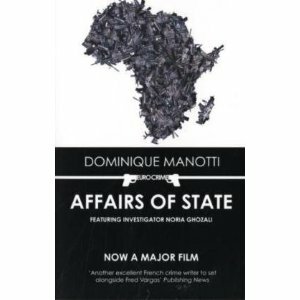 Affairs of State is a combination political thriller and police procedural set in France in the 1980’s. At its core the novel is the story of Francois Bornand, a friend and advisor to President Mitterand and head of a special unit within the security services. He can, and does, get away with things that only powerful people can get away with and his nefarious schemes include the highly profitable arms trade and he doesn’t care much who he does business with. As the novel opens small things start to go awry in Bornand’s circle, including an accidental murder committed by one of his people. The victim of this crime ultimately comes to the attention of a low-ranked rookie police officer named Noria Ghozali who is dogged in her efforts to uncover the truth behind the murder while Bornand is equally determined not to lose his status and influence. The theme that struck home from this novel it is that power is a dangerous thing. This is probably not news to anyone but it never hurts to be reminded just how easily some people (most?) will abuse their status and privilege given half the chance. They’ll also fight dirty, really dirty, to retain their power and influence once they have it. It would be quicker to write a list of the characters in this novel who didn’t display some form of corruption or immorality including theft, blackmail, mis-using government secrets, perpetrating violence against prostitutes and murder. The plain old vice crimes that virtually everyone participated in on a regular basis don’t seem worth mentioning when stacked up against their nastier counterparts. And while I appreciated that this depiction was undoubtedly realistic the way this insidious corruption was portrayed lost me a little. My problem was that the book starts off with a bang and never changes its tone. Virtually from page one men (yes they are all men) are doing horrible and/or immoral things to each other, to women, to their government, to anyone and everyone. And they don’t stop until the very end. This style meant that for me, after the first few pages there wasn’t much suspense because the expectation was set up that every few pages a nasty chap would kill or betray someone. So when every few pages some nasty chap killed or betrayed someone I was hardly surprised. There was some tension in considering which chaps would be doing nasty deeds and which chaps (or ladies) would be getting killed or betrayed but this didn’t really compensate for genuine tension. In the last quarter of the book this did change a little as the investigation gathered momentum and there were glimmers of possible alternate outcomes to everyone getting killed or sold out by someone they’d once thought of as a friend, but I’d have enjoyed the book more if it had focussed more on Noria and her investigation rather than having almost all of the attention centred on a succession of morally bankrupt men. Despite the fact I was numbed by the ‘shock and awe’ style of the book I was engaged enough to keep reading because the writing and translation are first rate. The story flows well, despite its complex political details which could have dragged but didn’t, and the writing is blunt in all the right places. It has also been a very long time since I read a book that packs in so much in a tick over 200 pages. Although I had misgivings about the overall style of the book I would recommend it to those who enjoy thought-provoking political thrillers and I would certainly not let my misgivings put me off seeking out more of Manotti’s work. I am in the minority reacting to the book as I have done, Affairs of State has been reviewed more favourably at Crime Scraps, Petrona and The Game’s Afoot. This entry was posted in book review, Dominique Manotti, France. Bookmark the permalink. Although I may have a different view of this book, yours was a very thorough review Bernadette and I like it even if I don’t fully agree with you. Bernadette, I agree with your excellent review, but I liked the book a lot more than you did. I think Dominique Manotti’s writing is meant to be a portrait of “normal” French politics and society, therefore you know what to expect especially if you have seen the French TV series Spiral. If you ever get the chance to watch this you will see women who are just as corrupt as the very smooth, but amoral men. Bernadette – Thanks very much for this thoughtful and detailed review. As you say, I’ve read other reviews of this one, and hadn’t, in the end, decided whether or not to read it. I’m actually glad when different readers have different points of view about a book; one gets a much clearer perspective on the novel that way. I agree, it is a very fair review. One thing to bear in mind is that the book was first published in France 10 years ago, and only in English translation last year, so this may date it a bit, I suppose. I do agree objectively with your criticisms but I found this book’s relentless cynicism quite charming! I also loved the character of the female police officer though was sad she faded out a bit – I hope she’ll appear in future. But I am not sure that the future does look rosy for translations of Dominque Manotti so perhaps we will never know? I was going to buy this at some point from the infamous Book Depository, but I really have to be sold on a book to fork up actual funds to buy it, since my library has limitations. I am still torn but positive comments here are tilting me towards doing it, as I like politics mixed in with murder.